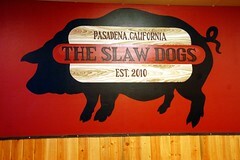 I had a Blackboard Eats deal for 30% off lunch or dinner at The Slaw Dogs. I rounded up Rants and Craves and Wan Life to Live to join me. 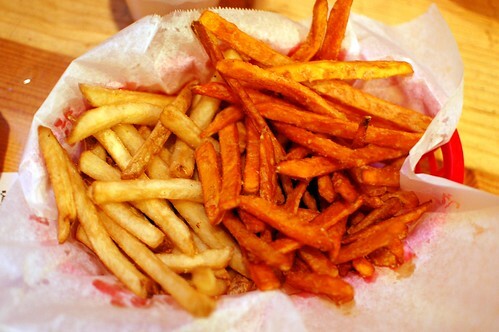 Half Belgian fries, half sweet potato fries ($3.99). #8 Thai Slaw Dog -- chicken sausage, spicy peanut-coconut satay dressing, cilantro-carrot slaw, crushed peanuts, Sriracha aioli ($6.59). 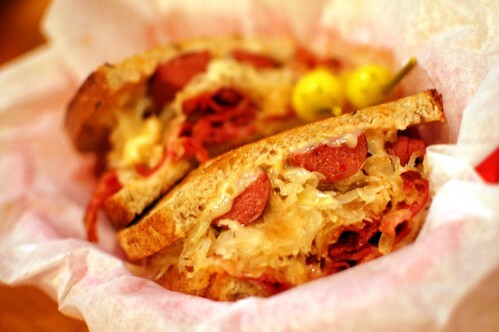 #5 The Reuben Dog -- butterfly spicy Polish, pastrami, Swiss, sauerkraut, Russian dressing, grilled rye ($6.59). Yes, that is mac 'n' cheese and bacon and jalapeños! #7 The A.B.L.T. 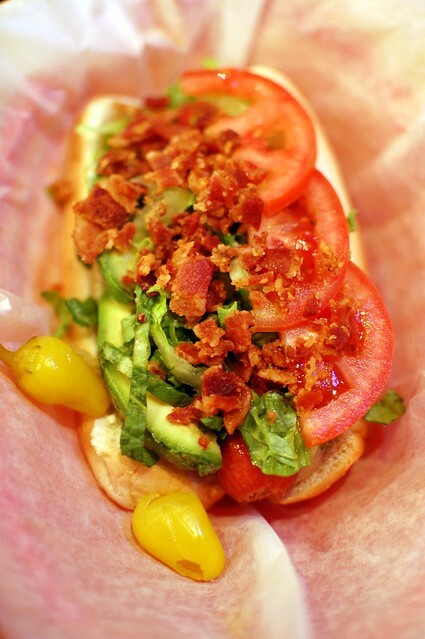 Dog -- double bacon, chopped Romaine, tomato, avocado, roasted garlic aioli ($6.29). 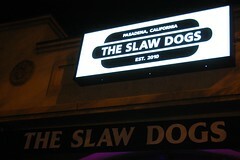 If you like hot dogs, you should visit. Interesting toppings. Good prices. Agreed, #7. Want right now, even through it's 8:30 AM. 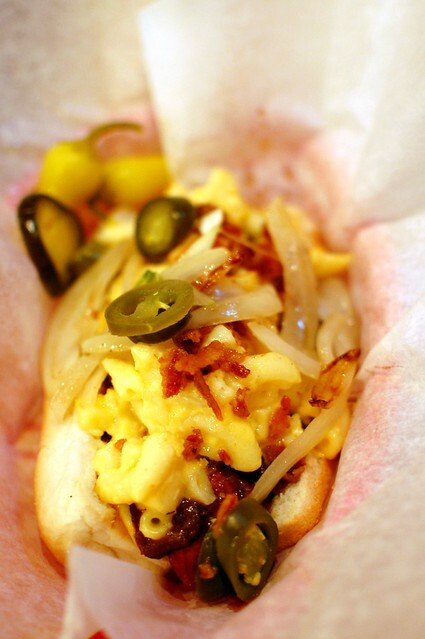 hot dogs are best with fun toppings. 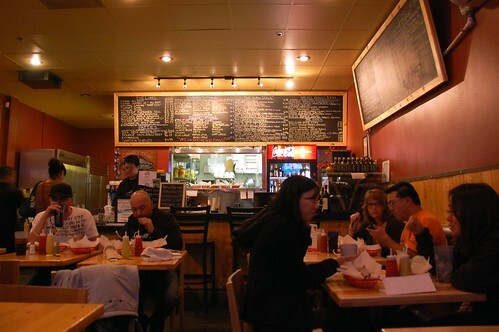 I liked them but I didn't love them, if you haven't tried already I'd definitely recommend Dog Haus, so delicious! And they serve everything on Hawaiian rolls, mmmm! i want the jalapeno/mac & cheese one. mmm. 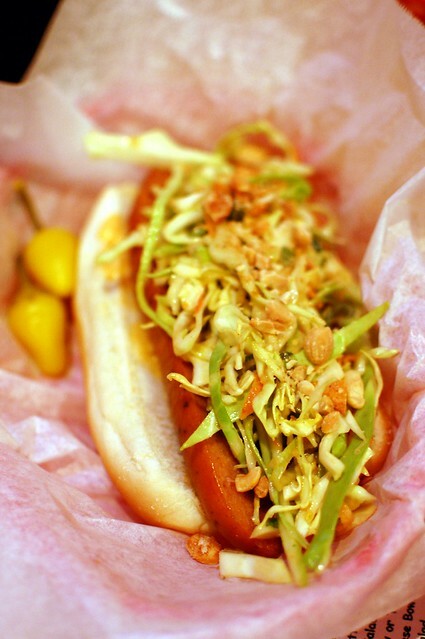 I went back a couple of months later and had a "normal" dog--y'know kinda plain w/ just chili, sauerkraut & stuff--not nearly as good as the tricked out dogs we had.